WOODWARD, Okla. – The Cinco de Mayo celebration dates back more than 150 years and is observed to commemorate the Mexican Army’s unlikely victory over the French Empire at the Battle of Puebla on May 5, 1862. On May 5, 2018, northwest Oklahoma will play host to a battle of different sorts. The Bullfighters Only Fiesta de Toros is set for Saturday night at Crystal Beach Stadium in Woodward. 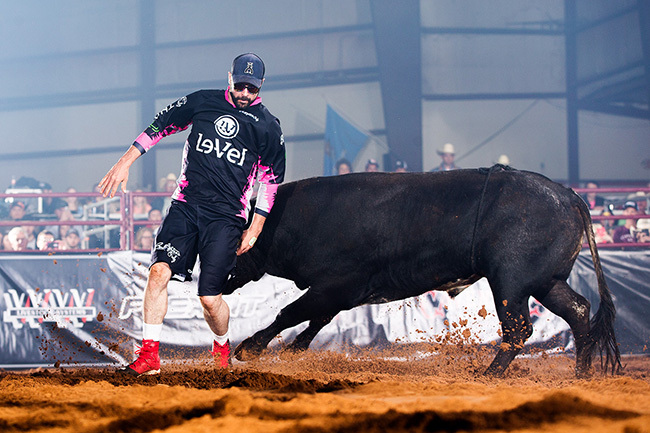 It will be a display of amazing athleticism as 15 men battle during this stand-alone freestyle bullfight while matching their talents with agile and aggressive Spanish fighting bulls. Bullfighters Only was developed three years ago by the bullfighters themselves. Since then, the sport has been showcased all across North America and has become a fan-favorite. The element of danger comes in the nearly 1,500 pounds of Spanish fighting bull that is just half of the equation in each bout. They’ve been bred to use their horns, their heads and their hooves as tools of destruction. In the other corner is the bullfighter, whose goal is to maneuver around and jump over the animal. The idea is to get within a breath the danger and escape unharmed. But the bulls have the upper-hand, and wrecks can happen quickly. It’s just another flavor added to the mix that helps make Bullfighters Only the premier organization in the sport.